An emotionally charged Anfield on the 25th anniversary of Hillsborough lingers long in the memory. For Liverpool fans, it is hard to joyfully reminisce about the dramatic 3-2 victory over Manchester City. A painful denouement saw the Reds ultimately come up short in the title race. Ultimately, the destination of the trophy had as much to do with a red card that day than any slip ups from Steven Gerrard a fortnight later. Two minutes into a fraught six of stoppage time, Liverpool could no longer control their central nervous system let alone the ball. Henderson went studs up into Samir Nasri’s shins. The midfielder’s desperate plea for clemency held no water with Mark Clattenburg who pulled out a straight red. He would play no further part in the Reds’ surge for the line. History tells us that Henderson’s absence was keenly felt in the ensuing exchanges against Chelsea and during the mental May bank holiday collapse at Selhurst Park. His pressing and high energy roving thrusts were becoming commonplace. Truth to be told, Henderson has always had to fight like Tony Bellew to prove his worth. Having been given a chance at Sunderland by none other than Roy Keane back in 2008, the boy had to form a body of steel to survive a decade of hard knocks which continue to this day. Even on Wearside, there was an apathy towards one of their own. The notion that the 28-year-old is not a proper top-level footballer is perhaps one of the more derisory observations that permeate the social media air. Determination can overcome anything, so sticks and stones won’t touch the man whose bones were affected as a 16-year-old by Osgood-Schlatter disease, a painful condition that affects the upper part of the shin. When monitoring the player, Sir Alex Ferguson once famously observed that Henderson: “runs from his knees, with a straight back. The modern footballer runs from his hips, and we thought this gait might cause him problems later in his career.” Ouch. The 20 million move to Liverpool in 2011 was never going to be easy and so it proved in a difficult first campaign where he was essentially played out of position. When King Kenny was usurped by the shiny new tenure of Brendan Rodgers, Henderson was offered a way out to Fulham as Liverpool attempted to secure Clint Dempsey. He vowed to fight for his place instead and became central to Rodgers’ best days as Anfield boss. A week before that crucial sending-off against City, the Northern Irishman said “At the end of last season, he played as a false winger from the left, coming inside and got goals. He played his first season here wide on the right. He’s played as a wing-back, wide in a midfield four. As quiet man Fabinho struggles to impose himself at the club and Naby Keita endures an equally tricky start with form and injury Henderson’s worth to his manager and team mates has actually grown, despite the observation that the Milner-Wijnaldum-Hendo triumvirate is more workhorse than show pony. What became increasingly clear during a busy summer is that the man has matured into a real leader on and off the pitch, especially in Europe. Any industrial language is kept to the grass (Loris Karius will know all about that after ignoring the skipper’s penalty advice on Radja Nainggolan) while he continues to impress in front of the media. He refused to blame Karius immediately after the desolation of Kiev and ensured the players celebrated their CL semi-final win over Roma with a banner for stricken fan Sean Cox. 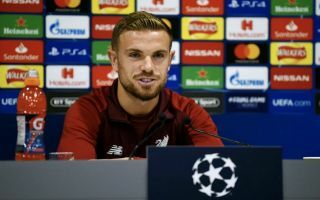 In the cauldron of the Parc des Princes, Henderson will hope to repeat his excellent September performance against the French superstars to prevent his side needing an Olympiacos-like night to qualify for the knockout stages of the Champions League. In one cameo during the opening game of the group, he won the ball back three times in succession from Marquinhos twice and then Neymar. This is the player the naysayers fail to acknowledge. “Sometimes I can be a little bit cautious in keeping the ball, playing a safe pass rather than an adventurous one. Maybe I need to take more risks going forward.” That was Jordan Henderson in November 2011. Some say nothing has changed seven years later. As Liverpool enter a crucial week, Klopp’s trusted lieutenant will ignore the negative to ensure that his latest red card doesn’t lead to the same feeling of desolation as four years ago. To his manager, the captain is “the embodiment of what it means to be a Liverpool player”. The German has his back as do his team mates. That is all that counts.